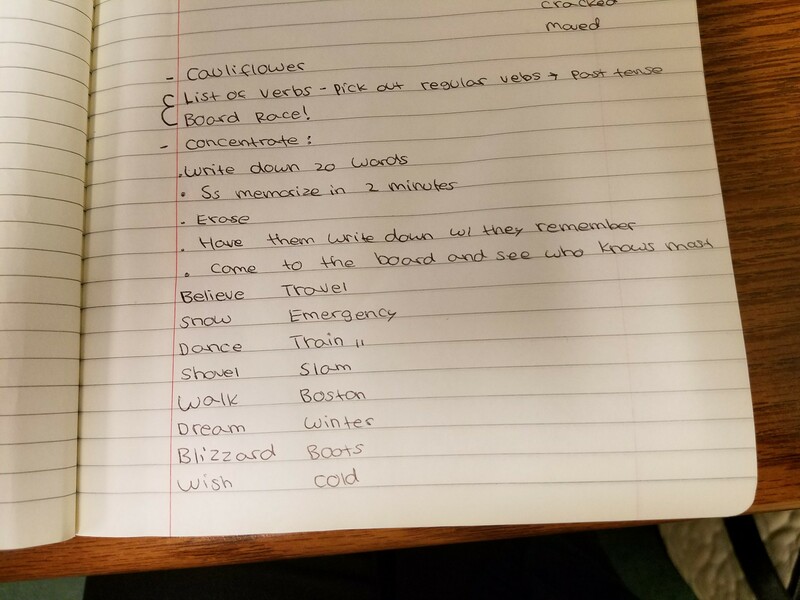 I played my own version of Concentrate with an intermediate ESOL class I was subbing Monday night– 16 words somewhat related to the incoming blizzard. Afterwards, I asked the students to write a story in the past tense with the verbs and nouns on the board. I didn’t have the chance to assess their writing levels beforehand, so it was a gamble. To my surprise, every student in the class constructed a beautiful story! Only two of the stories were about snow like I had asked for, but that’s okay. I read a story about living in Colombia and dreaming of snow– this same student told me she loves to write in English because it helps her learn. Another student wrote about how he dreams about his home in Peru and his life there with his family, a student from Kazakstan wrote about walking to Revere beach and dancing on the sand, and another student from Thailand wrote about wishing his friend in Boston was healthy and safe in the Boston blizzard 2 years ago. I don’t get to be in the classroon every week at my school [I’m actually an academic and career advisor), but when I do, it’s so much fun! *ESOL- English to Speakers of other languages. An acronym I knew before starting this job, but didn’t quite understand until I started working with my new students.